Passengers are facing severe disruption after the Channel Tunnel was closed following a fire on a lorry. 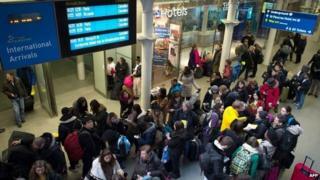 Eurostar and Eurotunnel, which run trains through the tunnel, have cancelled all their services for Saturday. No-one was hurt in the fire, which broke out at the French end of the tunnel, Kent Police said. Some passengers said they were evacuated from trains in the tunnel and given gas masks. Eurotunnel, which transports vehicles and freight through the Channel Tunnel, said the alarm had been raised when two CO2 detectors were triggered at 11:25 GMT. A load on a lorry on board a train en route from the UK to France was found to be smouldering, a Eurotunnel source said. Passengers and crew were evacuated safely, but the train is still in the tunnel, about a third of the way from France. Media captionJohnny Chatterton: "They never really told us exactly what was going on"
Eurostar, which operates passenger services through the tunnel between Paris, London and Brussels, said 26 trains have been cancelled so far. In a statement, it added: "We are sorry but we are unable to run any further trains today. If you were planning to travel today, we advise you to postpone your journey and not to come to the station." Eurostar's customer care number is 03432 186 186, or +44 1777 777 878 for people outside the UK. Eurotunnel's information line is +44 8444 63 00 00. Ben Lawton was evacuated from the train he was on and taken to what he describes as a "makeshift medical centre in Calais". "Then we were taken to an airtight concrete room within the tunnel and had to wait for two hours. Then we were taken by coach to Calais." Johnny Chatterton was travelling by Eurostar from London to Paris when his train was sent back to St Pancras, having been stopped at Ashford. "We've been told we have to try and book again, possibly for tomorrow," he said. "There is a queue for 300-400 people here at St Pancras." John Hope was travelling to Paris with his girlfriend when their train was turned back. "We were stuck outside the Channel Tunnel for about one hour with no information at all other than smoke had been detected and then we were told we would have to turn back to London," he said. "This was meant to be a birthday treat for my girlfriend but it has turned into a pretty poor experience all round." Stephen Hicks' train is heading back towards Paris after it was diverted. "I'm one of a group of 12 travelling back from from Les Moutiers to Ashford on a fully occupied train," he told the BBC. "Our train was stopped at Lille and there was confusion over what was happening. We are going to be in Paris for the night but we have no idea where we'll be staying." The Independent's travel editor, Simon Calder, said it was going to be difficult for people trying to make alternative travel arrangements. "There aren't that many flights between London and Paris and Brussels on a Saturday afternoon or a Sunday morning. People will be trying to re-book for tomorrow. "Motorists who were going on the tunnel from Calais to Folkestone will of course be able to just switch to one of the ferries which are operating - I understand that they do still have room." Because it is closer to France, Eurotunnel's French incident control centre at Calais is co-ordinating the response to the incident.